Software. That’s the only thing that separates the chassis of the Skoda Kodiaq vRS from a Sportline-trimmed version of the big, Czech family bus. The springs are no lower, and the active damper internals are the same - it’s just that the electronics that control them have been fiddled with in the name of sportiness. And so it goes with the rest of the car. Yes, it has some rather lovely fixed headrest sports seats with Alcantara quilting, but you can have pretty much the same chairs in a Sportline. The 2.0-litre, 237bhp twin-turbo diesel engine under the bonnet may be unique to the vRS in Skoda-land, but over at VW, that unit’s already been in available in the Tiguan for ages. It should come as no surprise that there’s, erm, nothing surprising about the Kodiaq vRS. There’s just about enough mid-range thrust (you get a handy 369lb ft of torque to play with) to make the car feel reasonably brisk rather than fast, it perhaps feels slightly more agile than the average Kodiaq, and with larger brakes, it stops a little more effectively. 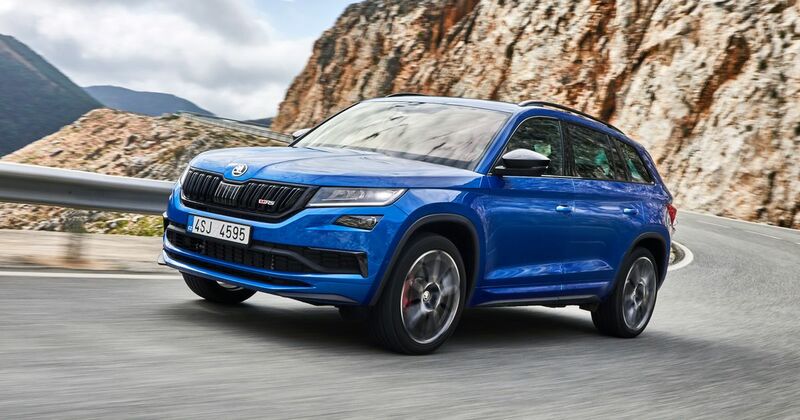 It’s a car that’s been tweaked rather than transformed, but you do at least get a variable ratio steering rack - which sees the steering ratio tighten the more you turn the wheel - which does a good job of making the porky Kodiaq feel lighter than it actually is. But not much - it doesn’t take much to get the body rolling around, and you’ll often find the front end washing wide. Skoda has apparently adjusted the four-wheel drive system, but it still feels like any other Haldex clutch-based setup. The final piece of the puzzle is a little actuator that sits near the end of the exhaust, giving the inline-four a kinda/sorta fake V8 burble. Which initially sounded weird, but I did grow to like it after spending a day with a the car. This all adds up to a car that is just… fine. It’s not bad to drive, but it’s not massively exciting either. 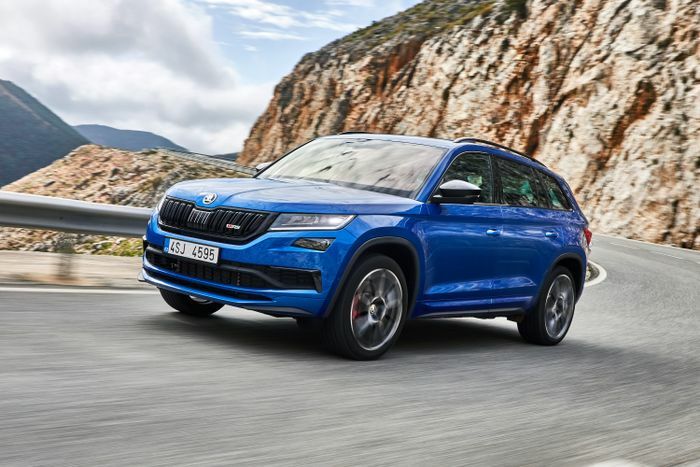 A performance SUV it is not, and all of the things it does well - comfort, carrying vast quantities of humans and human accessories - the Kodiaq Sportline 190 does too. For about £6000 less. Yep, you’ll be expected to stump up £42,870 for the vRS. 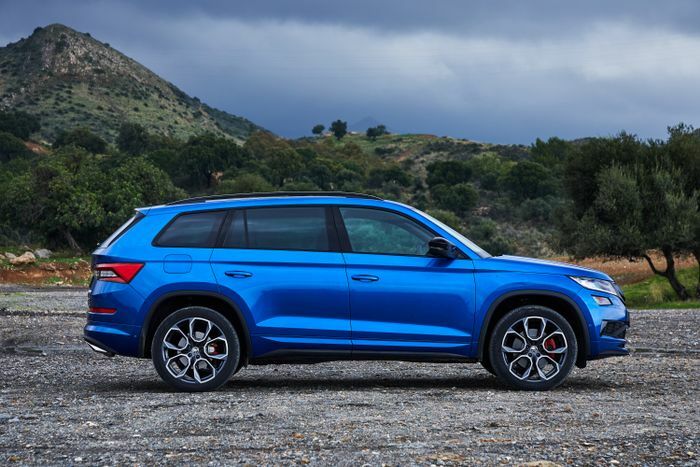 That seems like rather a lot when the (admittedly smaller) Cupra Ateca we drove the other week is £35,900, We weren’t especially enamoured with that either, but unlike the Kodiaq vRS, it’s considerably faster and more capable than the next derivative down the ladder. It’s not like you’re getting masses of extra equipment for the money, either - over the equivalent Sportline, the significant changes are mostly based around the fiddled dynamics, the pokier engine and all the sportified trim pieces. The silver lining is all of those bits and pieces make for a very handsome Kodiaq. 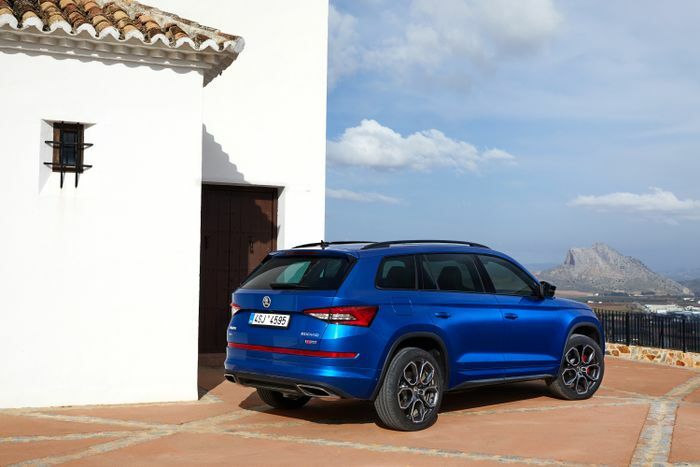 It might even be the most attractive SUV in the VW Group stable, and that, for a lot of people, is going to be more important than the warmed-up performance on offer. Skoda is only bringing 350 to the UK next year, and we can’t see it having any trouble shifting the lot. It’s just a shame those few hundred buyers won’t have something a little more exciting and worthy of that vRS badge.